This sailing catamaran offers three double cabins with ensuite bahtroom and on double with separate toilet. The crew is accommodated forward in their own private cabins which are accessible from the top hatch. 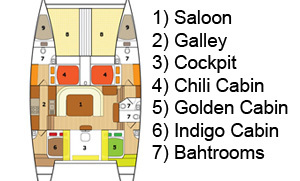 The saloon is very light and spacious with a u-shaped, custom built settee set around 2 tables. 10 Persons can sit here comfortably for breakfast, lunch or dinner, or you have the choice to sit outside in the cockpit which features one large table. A convenient and well-stocked galley is located in the starboard (right) hull and is fitted with a gas stove and an oven/grill. Amadeus has a desalination system on board; due to its 160 liter/hr capacity, fresh water is never an issue.